On Monday Apple announced, from the Worldwide Developer Conference keynote, that a new iOS would be hitting our iDevices very soon. CEO Tim Cook said that this iOS 7 would be “the biggest change to iOS since the iPhone,” Not only that, but "Installing iOS 7 on your phone is like getting an entirely new phone, but one that you already know how to use [and that is] beautiful and more functional," said Craig Federighi, Apple's senior vice president of software engineering. iOS 7 became available for developers yesterday, but won’t be officially released until the Autumn. Although no exact release date has been given, it’s thought that iOS 7 will be release around the same time as the new iPhone. iOS 7 has been confirmed to work on the iPhone 4, 4S, and the iPhone 5, along with the fifth-gen iPod touch, iPad 2, fourth-gen iPad, and iPad mini. First on our list of updates is the Control Centre. A simple swipe from the bottom of the lock-screen allows access features such as airplane mode, flashlight, screen brightness and more. On the other hand, a simple swiped from the top of the lock-screen will allow full access to the revamped Notification Centre. From here, users have access to features such as Today, which provides an overview of your day at a glance – from the weather report to birthday reminders. Another feature in which iOS 7 revamps is multitasking. Multitasking provides a more fully featured look at the apps you have open when you double click the home button. The new multitasking allows you to scroll through active apps, allowing you to dismiss apps with a simple swipe up. Next, Apple has also promised a 'smarter' multitasking, like making sure frequently used apps are open and ready to go when you normally log in. For example, logging into Twitter at 9:00am on weekdays. Finally, updates will take place automatically at more appropriate times. For example, when you're connected to the Wi-Fi or when plugged in. A picture showing Apple's multitasking feature. Siri will be receiving a voice makeover in iOS 7, with the female version of Siri will sounding less 'Robotic'. Apple have also promised an improvement on Siri for French and German speakers, with more language improvements coming soon. Also, Siri on iOS 7 will now use Bing search rather than Google. With "Apple picking" robberies (forgive me, it had to be done) making headlines in global news and theft of iDevices a predominant concern, Apple is upgrading the security by giving iOS 7 a 'security boost'. This means that if your phone is stolen and the robber turns of "Find My iPhone" or wipes your handset, it will not reactive the phone unless your Apple ID is entered. Pretty neat, huh? 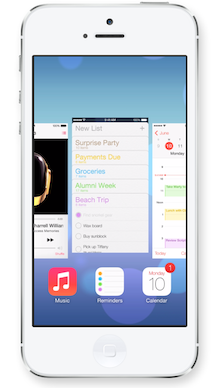 A picture showing most of the features on iOS 7. Those of you who run OS X will already know what the Keychain feature is. For those who don't, Keychain allows your device to remember passwords and credit card numbers. iOS 7 will allow Safari to enter these passwords (or credit card numbers) automatically when you make a purchase. "Every time you create an account, you can have Safari generate a unique, hard-to-guess password. And remember it for you," according to Apple, which insisted that 256-bit encryption will make iCloud Keychain "highly secure." There's really only one update with Messages, and that's the look and feel. iOS 7 Messages embrace the "flat" design, with the familiar bubbled messages being totally removed. You can also swipe to the right to view all messages. As of iOS 7, Apple claims that browsing will be "bigger, better and more beautiful," What this really means is users can now browse in full screen, have access to the new tab view which you can use to scroll though open tabs - which can be dismissed by the swipe of a finger, and finally use a unified search/URL bar which will auto-suggest websites and search terms. Also, the "Shared Links" view shows a list of URL's from your Twitter timeline, whilst the "Reading List" section allows you to scroll though saved items. To further help with the organisation of images, iOS 7 will group photos that were taken around the same time / date into separate folders, or Collections, for easier access. 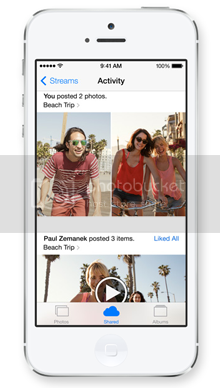 Furthermore, iOS 7 will allow for shared photo streams, so you can add one of your photo's to a friend's collection. A picture showing Apple's photo share feature. Although you may want to hold off using Apple Maps for your in-car driving directions just yet, other iOS features, like Siri, will be coming to a selection of cars in 2014, like BMW's. Dashboards will adopt the iOS interface so you can safely make phone calls, access your music, send and receive messages, get directions, and other cool features. Finally, we have the weather app enhancement. In iOS 7, the weather app will include more animation and easier access to the various cities on which you want to keep tabs. This should make for a more pleasant viewing experience, compared to that of the current, sometimes confusing system. Read more about iOS 7 on the Apple website, here. To conclude, Apple has noted that there is far too many iOS 7 enhancements to highlight in just once speech. For example, the new iOS will allow for higher audio calls when made over Wi-Fi - like when using FaceTime. This is just one of the many other features that we can look forward to. Personally, I really like some of the features Apple has created. However, I'm really not keen on the retro-simplistic style Apple has gone for with the design. With that said, I think I will probably end up downloading iOS 7 when it's officially released in the Autumn. That's just a brief oversight into some of the features of iOS 7. What do you think? Do you like the retro look? Are you pleased with the boost in security? Let us know in the comments below.